The BEST Chicken Cacciatore in a rich and rustic sauce with chicken falling off the bone is simple Italian comfort food at its best! 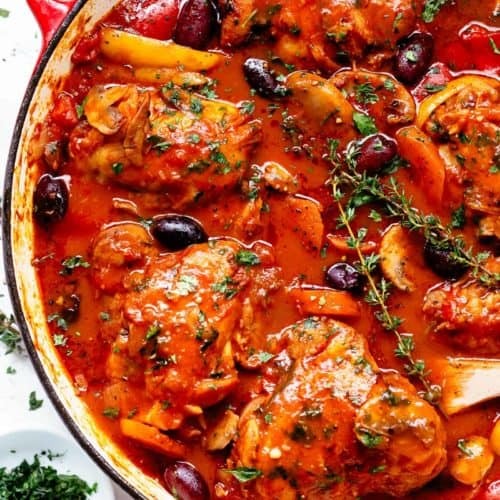 Authentic Chicken Cacciatore is an Italian classic, and you’ll never get a more succulent home cooked meal than this recipe! 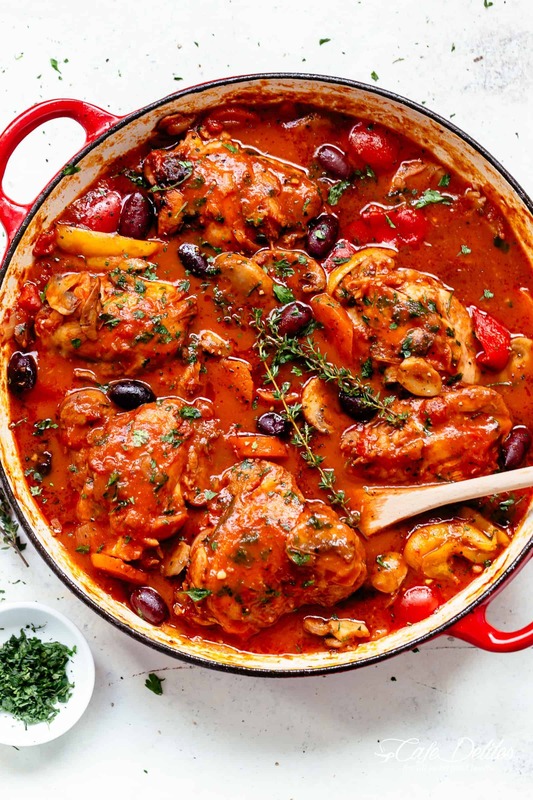 Easy to make and loved by the entire family, Cacciatore aromas fill your entire house with comfort and warmth as it cooks itself on the stove or in the oven! 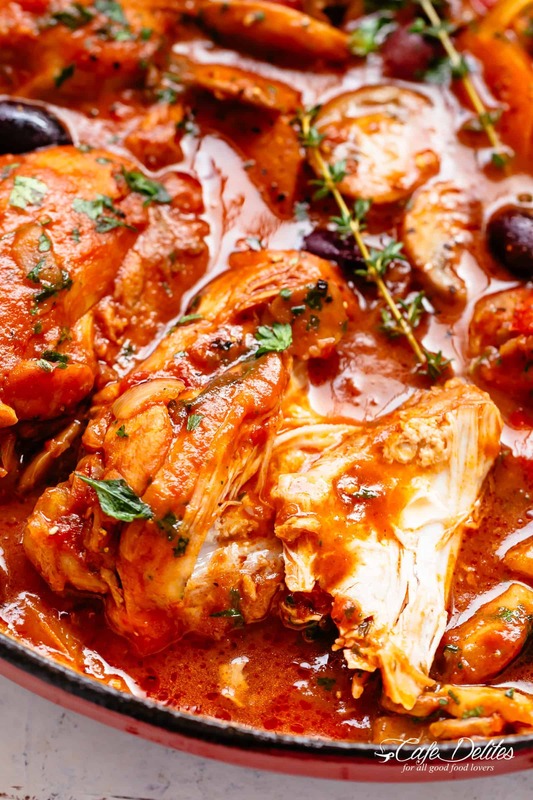 Cacciatore means hunter in Italian, and alla cacciatora translates to a ‘hunter-style’ meal with chicken (or rabbit), onions, tomatoes, herbs, vegetables, and usually wine or vinegar. This is one of those recipes I found years ago in an old, tattered Italian cookbook. Every time I’d remake it through the years, I’d adjust something in it to eventually reach a cacciatore recipe so perfect, it’s one recipe your entire family will look forward too! HOW DO YOU MAKE CHICKEN CACCIATORE? 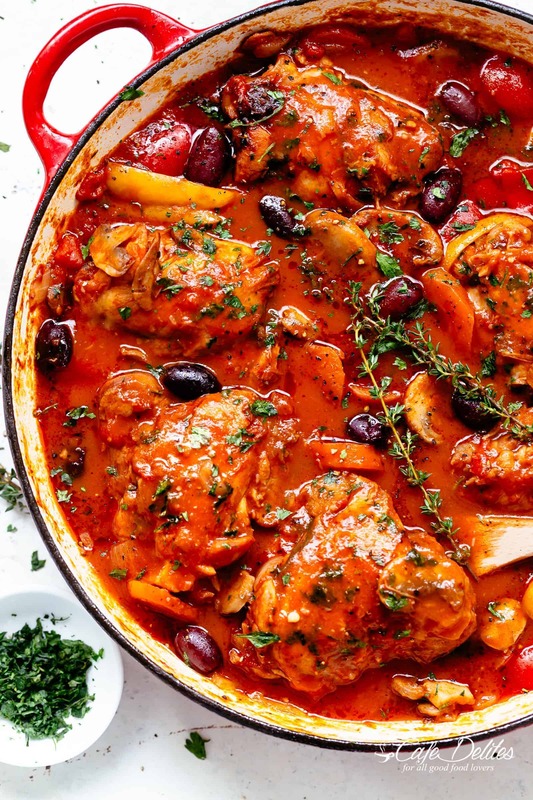 This Chicken Cacciatore recipe is an easy throw-together-meal with the most delicious sauce full of incredible flavours! 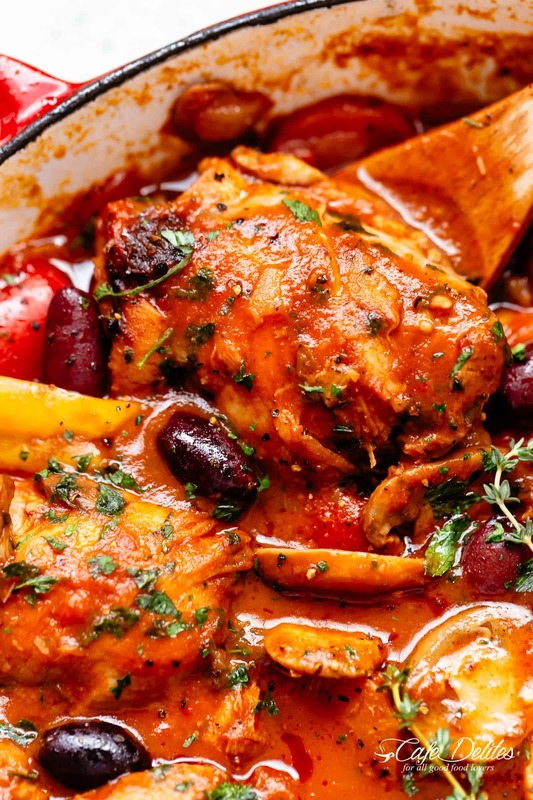 Garlic, bell peppers, onions, carrots and olives swimming in a rustic tomato Cacciatore sauce, simmering and soaking into juicy chicken thighs until they fall off the bone and melt in your mouth! If there are any leftovers, the flavours are even better the next day! Or you can freeze it for up to three months in meal prep containers for a ready-made-meal when you need it! The BEST Chicken Cacciatore in a rich and rustic sauce with chicken falling off the bone is simple Italian comfort food at its best! Authentic Chicken Cacciatore is an Italian classic, and you'll never get a more succulent home cooked meal than this recipe! Easy to make and loved by the entire family! Heat oil in a heavy cast iron skillet. Fry the onion until transparent (about 3-4 minutes) then add in the garlic and sauté until fragrant (about 30 seconds). Add the peppers, carrot, mushrooms and herbs; sauté for 5 minutes until vegetables are beginning to soften. Add the chicken and sear on both sides until golden (occasionally mix the vegetables around the chicken in the pan so they don't stick). Pour in the wine; allow to simmer and reduce down (about 5-6 minutes). Add the crushed tomatoes, tomato paste, Roma tomatoes and chill flakes. Season with salt and pepper to your tastes. Continue to cook over stove top OR in the oven following the instructions below. Mix all of the ingredients together; cover with lid, reduce heat to low and allow to simmer (while stirring occasionally) for 30-40 minutes or until the meat is falling off the bone. Add in the olives, allow to simmer for a further 10 minutes. Garnish with parsley and serve immediately. Transfer the covered skillet to a preheated oven at 375°F (190°C) and cook for 50 minutes. Remove the lid and cook for an additional 20 minutes until the chicken is tender and falling off the bone, and the sauce has reduced down. If the sauce is too thin for your liking, add 2 tablespoons of tomato paste while it's simmering to thicken. This chicken cacciatore can be made up to 1 day ahead, cooled, covered and refrigerated. Rewarm over low-medium heat. Transfer the cooled cacciatore into an air tight container and transfer to the freezer. The day of serving, thaw it out in the morning and bring to room temperature. Transfer to a skillet / pan and reheat over low-medium heat until warmed through. Very good recipe. I am Italian and tweeked it in the way I recall the recipe. I lost my family recipe. One of my favorite dishes. Made it last night. Perfect for a cold Southern California night. I wish I had more left overs. Very impressed with this recipe. Thank you for bringing this dish back into to my life. I recommend it for family dinners. 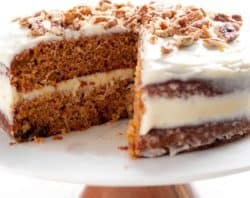 I love this recipe as-is and love love love that it has proven very flexible and forgiving, depending on what I have on hand. I have subbed various amounts and types of fresh or canned tomatoes. Subbed dried herbs if I don’t have fresh. Added extra fresh herbs when I have them. Used tomato sauce if I’m out of paste. Added other veggies to bulk up the nutrition (one time I tried a couple zucchini, another time a head of cauliflower.) I have tried skinless breasts and dark meat. And basically, whatever I have had on hand, following the basic idea and proportions it always turns out delicious. I share this recipe with lots of folks, since it’s an awesome base recipe. Thanks! What a beautiful recipe! I can’t wait to make this for a dinner party this weekend! Can I replace the cast iron skillet with a regular soup pot? Thanks for the comment! I always love to hear when someone loves a recipe. I am glad that you liked it and thanks for following along with me!! Can you use dried herbs for the parsley & basil? It’s winter time & fresh ones are expensive and the rest would go to waste. Also , the roma tomatoes, do you use fresh or canned? & if fresh, how many tomatoes are 7 oz??? Hi Sandra. You can use dried herbs that should be fine! You may need to taste test as you go. I use Fresh Roma’s here. Not sure how many weigh 7 oz as I weigh them at the supermarket. Does your grocer have a scale? Plan on having the Pastor and his mother over for dinner . I love him but he is very hard to cook for.. Not much that he will eat..Vegetables are a no no except raw carrots potatoes and green beans He does like chicken cacciatore and I have been searching for a recipe for ever . This sounds yummy and I am sure he will love it. I know that I will. Thank you so much. Subscribed to your site and looking forward to more recipes. I made this for my family last night, the only one who didn’t like it was my three year old… surprise, surprise! The S.O. loved it and my One year old practically mauled me for my plate. The only thing I did differently was 86’d the wine, because I didn’t have any and added shredded Zucchini. This has definitely made it’s way into my Recipe folder. THANK YOU! YAY!! That sounds fantastic! Thank you so much for letting me know! I am so glad that you enjoyed it! are these capsicum very hot? I’ll probably have to swap out the olives and put kidney beans in or something like that but can anyone recommend alternatives to the mushrooms? Some of the house aren’t a fan of the texture(or supposedly the taste? ) and I always struggle to adequately substitute in these type of recipes. It tastes totally fine without any mushrooms. I’ve omitted them, and it’s still great. I have also tried adding chopped zucchini once and a head of cauliflower another time – both worked out great, so you could always try one of those. What type of red wine do you use? I love red wine! Any of your favorite flavor of red wine that you have is perfect for this recipe. 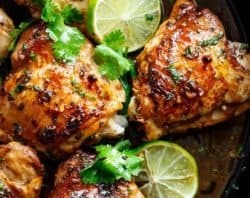 You are not adding a lot but just enough to have that added sweetness and flavor in this chicken. Thanks so much for following along with me! Enjoy your chicken! I made this tonight. It was just wonderful! Very authentic Italian taste. The recipe is just perfect. I served it with zucchini noodles and it was a great pairing. Thank you so much for the recipe! This looks delicious! Thanks, too, for including suggestions for side dishes. This chicken cacciatore recipe looks wonderful; however, I did notice it has a lot of cholesterol in it. I am hoping using boneless, skinless chicken breasts will create a less cholesterol-heavy dish. Will have to try it! While we are trying to reduce carbos, as most of us should, we still have to watch the fats! My whole family loved this Karina! Thank you! Excellent recipe. Will make again. Used a few items I had on hand instead of exactly as written. Grape tomatoes instead of Roma, Boneless thighs and chicken broth instead of wine. Top recipe, finally I’ve found the one I’ll keep. Delicious and more-ish, thank you! (9 drumsticks instead of 6 thighs … so perfect and so cheap, I’ll probably do that again). Genuinely a keeper, which is more than you can say for most web recipes. YAY!! I love keeper recipes! Thanks so much for trying it out and making it your own. Thanks for sharing! 0.634 cups or 5.072 ounces. Hope that helps answer your question. 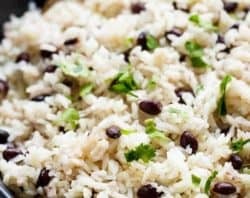 I just made this recipe last night and it was amazing! I’ve eaten this in Tuscany and it truly is just as great thank you!! Made this over the Christmas holiday week and must say it was full if flavor and rather tasty. Thanks for sharing this receive; I will make again. I made this. It was delicious. My husband and I both loved it!!! I lost my Aunts recipe for chicken cacciatore. I’ve tried many in hopes of replacing it. This is better than her original authentic Italian recipe. Followed the recipe to a “t” save for using loads of fresh parsley (like my aunt used to do) and went with boneless, skinned thighs instead of bone in. Thank you. This recipe is going into my hand written recipe box. Please, explain what is chill flakes? Hi Danny. You will find it in the spices and/or seasonings section in your grocery store or supermarket. (Crushed red pepper or red pepper flakes or Red Chilli Flakes is a condiment consisting of dried and crushed (as opposed to ground) red chili peppers. Made this last night. It was absolutely delicious! My very picky son loved it, as did my husband. I will definitely make this again. Great recipe! Thank you! Yay! You’re welcome Jen! Just made me smile BIG! 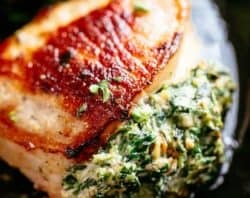 Can you use chicken breasts instead of thighs? And if so how would you alter any of the instructions in the recipe? Thanks this looks so awesome!!! Splendid dish! I made it today and all of my family, including my picky 4 year old, LOVED it! Thank you!!! Absolutely fantastic! Received rave reviews from hubby and friend last night. Made stove top style and followed recipe exactly, except I omitted parsley and olives. So glad I have left-overs. Definitely a keeper! Wowzers! This was amazing! Such wonderful flavours on a cold winter’s night. This recipe is a real keeper! I made this last night and it was delicious!We’ll be eating it for few days as I used a bit of extra chicken, love leftovers! I love your recipes Karina, they always turn out amazing! Thank you! This was absolutely amazing. I made a few substitutions because of what I already had on hand: 11 chicken drumsticks instead of 6 thighs, kalamata and green olives instead of black, and omitted the tomato paste to ensure there was adequate sauce because I increased the amount of chicken. Served it over a side of seasoned roasted thin-skinned potatoes which baked in the oven for the same time the chicken simmered on the stove. Would definitely make it again, for guests. Would it be bad if I used artichoke hearts instead of pitted black olives? Hi Ronda! No not bad at all! This is cooking away in the slow cooker as I type and the smell is delicious! Fingers crossed I’ve done well. 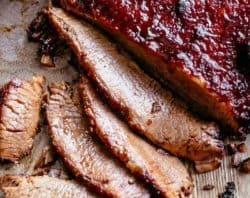 Can you please do more slow cooker recipes? I am munching on one of your brownies right now (um FREAKIN DELICIOUS, only down side is I can’t stop eating them!!) and am newly addicted to your recipes. Thank you for being such a good cook and sharing!! Haha Asher! I feel your pain! And you’re very welcome! I must have looked at a dozen, what I deemed iffy, Cacciatore recipes before I settled on this one. Jackpot! I did mine in the slow cooker (6 qt). I prefer chicken breasts to thighs and without having the weight most internet conversions were: 2 thighs:1 chicken breast. Thanks to my mother, I never cook anything for less than an army and well, 3 chicken breasts, just didn’t seem like enough. Stop judging. If anyone is interested, I used 3 lbs of boneless, skinless chicken breasts and doubled the entire recipe, except for the mushrooms. Dont freak out. It filled up the entire pot and I thought there was no way the mushrooms would fit at the end: they did. I used red wine vinegar in place of the alcohol because it was all I had, but I would not recommend this. Balsamic would be much nicer. I added a chicken boullion to prevent my excessive salting and some parm cheese, because who doesnt like cheese? Collectively, we don’t like olives, thyme or roma tomatoes so I omitted them. Cooked everything for 7 hours, shredded the chicken, added the mushrooms and cooked for another hour. I might add some tomato paste tomorrow if it doesn’t thicken a little overnight, but I’m on the fence because it’s seriously A-MAZING the way it is. I plan on serving over roasted cauliflower. Bonus: No one will be asking “What’s for dinner?” for the next two nights, which makes me want to blow up balloons and throw glitter. Chelsey your comment is GOLD! Haha I’ll blow balloons up with you! I know THAT feeling! I’m so happy you tried this and adjusted it to your liking. Tomato paste will just add another dimension of flavour. I say go with your gut instinct! Hi! 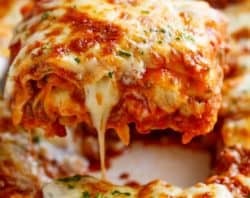 This recipe looks really good and I plan on making it today, but I sadly don’t have any Roma tomatoes or cans of crushed tomatoes. Would it still work if I chopped up some regular tomatoes and used them? Hi! I plan to try this recipe tomorrow, and I was wondering what type of black olives you used. Were they Kalamata type olives or regular old canned black olives? I find they both give their own distinct flavor to recipes, so I want to make sure to use the right kind. Thanks! Hi Jennie! I’ve used both in the past and both are great in this, however, I prefer the mildness of Kalamata olives. 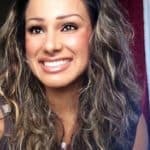 Hey Karina, you questioned someone on if they used tomato paste, but no where in the recipe or blog post is tomato paste. Couple you please clarify as I was planning to cook this tonight. Thanks. I made this for my wedding anniversary and it was very good. Thank you for sharing. This looks amazing! Makes me so hungry! You always have the best recipes and great photos! love the recipe! Can I use boneless chicken Breast as lenear substitute for the boneless chicken thighs? Thanks! I just woke up after skipping dinner last night and all I can think is – I want to dive into this dish, preferably from a height – it looks so delicious! Thank you Helena! From height would be even better 😉 I like your thinking! Wow. That looks amazing!!! The chicken looks so tender. Hi Janice. You can use vinegar as a substitute. Balsamic or white wine vinegar.